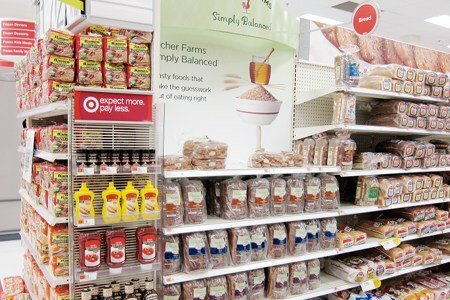 Can You Find Healthy Bread In Target? If you are like me, you live in a town near a Target that has food in it. My Target just added fresh food such as eggs, bananas, and lunch meat. I feel a bit squeamish about buying food at the same place I buy my underwear BUT so many people have asked me what I think of Archer Farms that I decided to get over it. Archer Farms is a Target brand that advertises a “premium food product” and their 100% whole wheat bread retails for $2.69. While I can’t cover all their offerings, I decided to take a look at their bread. Bread is one of those foods that most of us purchases and it can be tricky to figure out if we are buying the best one. 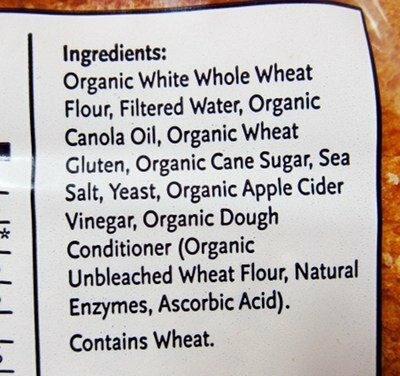 The first thing I look for is “100% Whole Wheat” or “100% Whole Grain”. There is wheat bread out there that says “made with whole grain” but isn’t the ideal of “100%”. For almost any bread that you are going to find in the supermarket, Target, Walmart, convenience store, this is going to be the best you can do. Why? Some supermarkets have a freezer with great bread in it. The brands are Alvarado and Ezekiel and they have zero preservatives and less sugar. They don’t need the preservatives since they are frozen. Whole Foods will not allow preservatives in the food it sells. I know many of you don’t have a Whole Foods near you (mine happens to be near the Target) - so I will get complaints. But, maybe you can finds something similar near you. Funny story. As I was waiting in the customer service line in my Whole Foods there was a lady complaining that her bread grew mold after 3 days on her counter. Hmmmm. Did she miss the “no preservatives” credo? I keep my bread in the freezer because it does tend to grow stuff before we can finish it if I keep it on the counter. Please share how you have solved your healthy bread problems. I find that I really dislike Ezekiel Bread but a good just grab and go shelf bread is "Natures Own White Wheat" it works for everyone in my house that refuses to eat bread that is not white. I have a hard time with bread. I buy St. Alvarado Street which Trader Joe's carries. All natural made with wheat berries and flax, it yummy and only 50 calories a slice!! I know Whole Foods carries it to! It is difficult to find the best bread but this really helps! I buy Nature's own 100% whole wheat. It's ingredients are about the same as the Archer bread but it only has 50 calories per slice. I too like Nature's Own. They have a high fiber one. I do lots of grocery shopping at Target. Prices are less than my local supermarket. I like most of the Archer Farms products. In our quest to have more control over our food and money, I bought a bread maker at a thrift store. In fact, we're on our 2nd one. This has been our best solution. We know exactly what's going in or not going in our bread. I can add oats, which *completely* disappear, and my son is none the wiser. It's fool proof. You put the ingredients in and leave it alone. Your home smells like fresh bread and you have hot goodness to eat! Yum. Same here - make my own 'no knead' bread with 4 ingredients, bake 2 loaves so I have one to freeze and only have to make it every other week. Doesn't take that much time and much better for the fam. I have been buying Alvarado (either Whole Wheat or California Protein - higher in protein) at our local supermarket. Since we usually go through a loaf in a week+, I simply keep the bread in the fridge. I have tried Ezekiel, but find unless it was put into the freezer section fairly recently, it tends to be dry and cardboard-like. I use Ezekiel Sprouted Wheat Grain bread with Sesame Seeds!!! I use it toasted; the seeds get really crunchy. I put Almond Butter on top!!! Great way to start the day, and it keeps you full til lunch!! Add some fruit as well. Seriously? 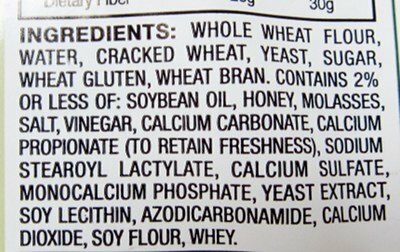 Molasses and sugar added to bread? I dont eat bread anymore due to intolerances so I thought I'd check what I am giving my kids in case its added and I hadn't noticed. I have a homebrand ( & standard white)loaf which has neither added- Ingredients listed are: wheat flour, bakers yeast, vinegar, iodised salt, canola oil, soy flour, emulsifiers(481, 472E, 471), vitamins(thiamine, folate).FYI, I', in Australia and notice that sugar is added to more and more products here over time. i just started buying the ezekiel bread and english muffins for my kids. no complaints yet. I too am shocked that sugar needs to be added to bread in order for people to eat it. yes snack girl, I too look for 100% whole wheat or grain in other bread products as well. Healthy Living is another good brand with similar numbers. I get their sandwich thins - same numbers but for two slices. Does anyone have a Great Harvest Bread Company nearby? It's a wonderful bread store and their wheat bread will last on your counter for up to 2 weeks - or you can freeze it. It's not inexpensive, but they make beautiful, wholesome products and you can always get a generous taste if you want to try something new. I was so happy when one opened near my home. I recently discovered the Ezekiel Low Sodium bread, and it lasts well in the fridge. Same for Great Harvest - Their High 5 Fiber bread has great flavor and texture, and I hardly had to worry about storage, as it disappeared quickly (but I kept it in the fridge as well)! Trader Joe's has a 7-Grain Sprouted Bread that is amazing toasted or used for sandwiches. I keep mine in the fridge and it lasts a good while. Tastes delicious with nutella and banana on top and is very filling. Plus, only 1 WW Points Plus per slice! I don't eat a lot of bread, but my husband loves sandwiches. I make bread for him in the bread machine - it's just too easy, it does all the work for you! It's a great investment. I got mine passed down from my grandmother. When I do eat bread myself, I make sourdough. Most sourdough bread recipes only require flour and water, and salt if you want it. Because it is fermented it lasts a LONG time. I had a loaf last 6 weeks before I threw it out - and I didn't throw it out because it went bad, but water had leaked all over it somehow.